Most of my regular readers are probably aware of DDOT's 11th St Bridge project, which is replacing the existing 11th Street Bridge over the Anacostia with three new bridges...one for each direction of freeway and a new local bridge that'll link 11th St SE with Martin Luther King Ave SE. A few of you may know that the Southeast Freeway between the 3rd St Tunnel (I-395) and the 11th St Bridge has carried a hidden Interstate designation: I-695. 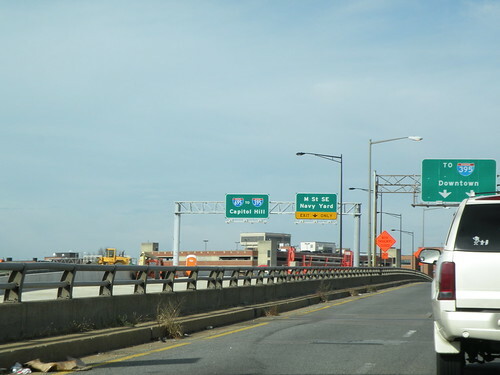 As part of the 11th St Bridge project, DDOT requested in 2009 to truncate I-295 (which had crossed the bridge, the ramp connections above M St SE that were taken out last year, and extended to Barney Circle) to Anacostia and extend I-695 across the 11th St Bridge. This is quite likely the first I-695 shield in DC in 40 years, if not ever. 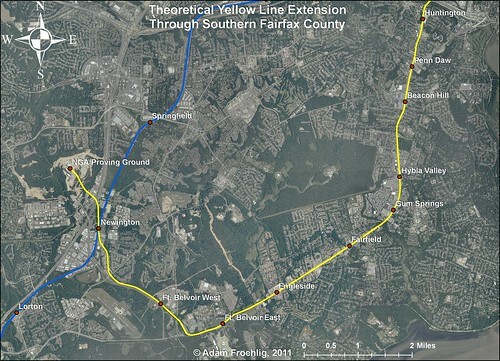 I-695 was originally slated to follow both the Southeast Freeway and also the cancelled "West Leg" of the core freeway system, from I-395 at Maine Ave northwest to I-66 near the Roosevelt Bridge. Though it's possible that the covered panel here may have had an I-695 shield at one point, it's hard to say for sure. - Fairfax County will be hosting the third in a series of eight meetings on the county's Bicycle Master Plan, focusing on the Mount Vernon area (mostly Mt. Vernon District and part of Lee District). The meeting will be at the South County Government Center on Route 1, from 5:30 to 8pm. - Alexandria will be hosting the latest of its High Capacity Transit Corridor Study meetings at Patrick Henry Elementary School from 7-9pm. The meeting will focus on the latest concepts for Corridor B along Duke Street. - WABA is hosting a Happy Hour at Brasserie Beck in DC at 11th and K NW. The Happy Hour begins at 5pm. Unfortunately, I can't be in all three places at once. 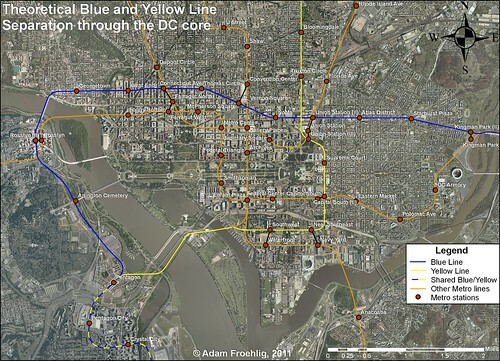 Many months ago, I had several people ask me to post my transit concept maps for DC online. After those months of procrastination, not to mention adding a few more maps to the pile, I've gotten around to it and created a Flickr set. More maps will be posted to the Flickr set as they're created. A persistent problem spot on the area's bicycle/pedestrian network has been on the George Washington Parkway near Memorial Bridge. In this area, bicycles and pedestrians transiting between the Mount Vernon Parkway and the Memorial Bridge must cross both the northbound GW Parkway main lanes plus a northbound ramp at-grade. The site has been the scene of numerous crashes this year (the latest being a pedestrian right before Halloween), all of which involve either a vehicle hitting a cyclist or pedestrian, or rear-end crashes among vehicles as some drivers stop/slow to allow bikes/peds across and the vehicles following behind do not stop and thus crash. Even without the crashes, regular vehicle traffic has other concerns. The area is confusing jumble of ramps going all sorts of different directions. All too often, drivers not familiar with the area realize too late that they are in the wrong lane for the particular ramp they want to take and try to change it at the last possible moment. The result is further congestion and the occasional vehicle crash. Unfortunately, there is no easy fix to the problem. Longstanding National Park Service policy is for no traffic signals along their parkways, so this precludes putting a traffic signal or even a HAWK signal at the location. Ideas for a bike/pedestrian overpass have brought concerns about loss of trees and "overhead obstructions". This has led to more recent calls for a bike/pedestrian underpass, but this will require a fair bit of money and regrading to implement. Ultimately, something will have to be done. It will be a bitter pill to swallow, but the only way NPS can reduce the crash risk is to do something that either costs a lot of money or goes against their current policies. 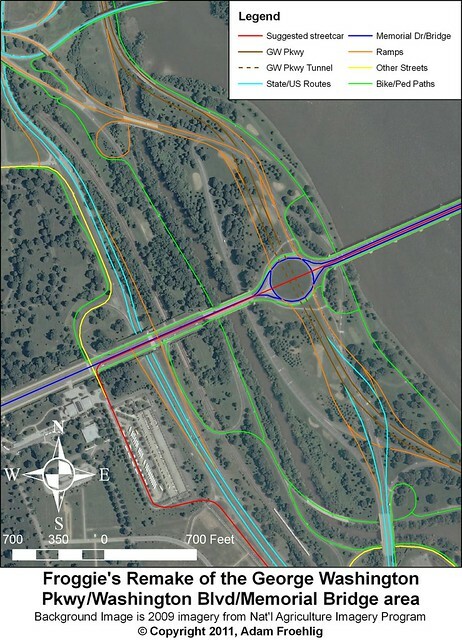 Straightens out the GW Parkway main lanes and moves all entrances/exits to the right. The existing configuration has three left-side entrances/exits. Retains all existing access and greatly streamlines and simplifies the ramps connecting the GW Parkway to Memorial Bridge, Route 27, and Route 50 West. Elimination of many of the existing roads/ramps allows for renaturalization/revegetation of those ramp locations to mitigate the loss of trees due to construction. Eliminates the need for at-grade crossings for bicycles/pedestrians connecting between the Mt. Vernon Trail and Memorial Bridge. 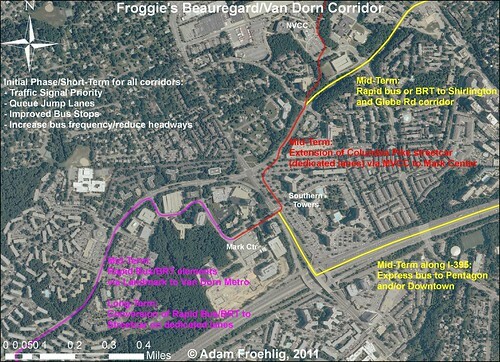 Greatly expands the bicycle/pedestrian network in the area, utilizing some of the eliminated roads/ramps. Allows for separate bicycle/pedestrian paths along this segment of the Mt. Vernon Trail, very much needed due to heavy trail use. The bicycle path can utilize the existing northbound lanes. 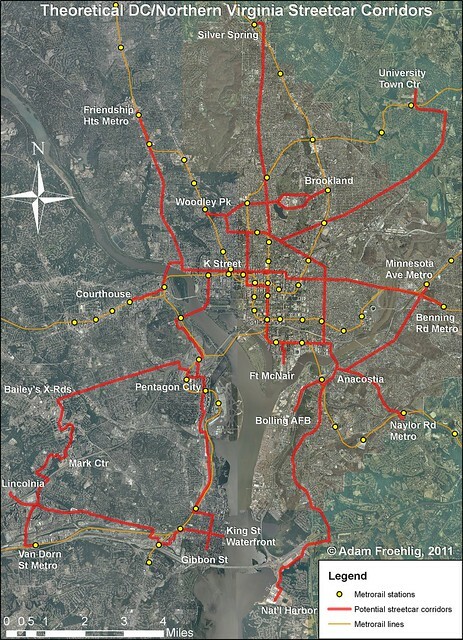 Allows for the possibility of a streetcar line across Memorial Bridge, connecting K Street NW at Washington Circle to the Pentagon and the proposed Arlington streetcar network. Allows for a full interchange on Route 110 connecting to both Memorial Bridge and the Iwo Jima/Marine Corps memorial (as shown on the map). Alternatively, this option could be left off and the existing congifuration along Route 110 remaining as-is. This proposal would require a lot of money and would likely involve multiple years of construction, but the benefits of a reduced road footprint, better safety, and an expanded bike/ped network are well worth it. Even if my specific proposal isn't followed, it would be in NPS's best interests to look at a long-term solution for this area and implement it as soon as possible.